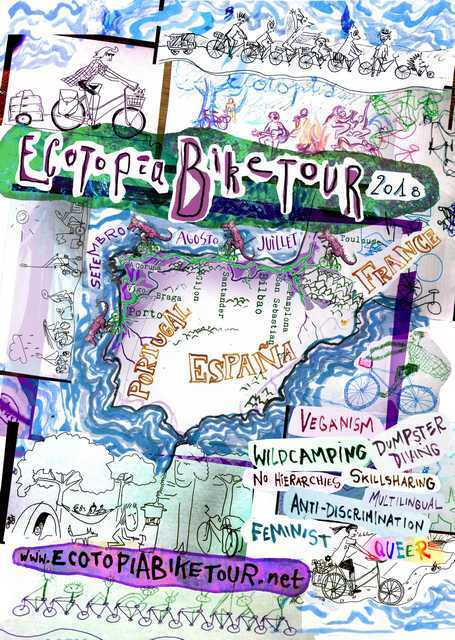 Ecotopia Biketour is a self-organized, international community that has been organizing a yearly bicycle tour in different regions of Europe since 1990. During the tour we visit environmental and social projects and practice forms of activism and sustainable living. We cook communal vegan food, practice consensus decision making, and share skills by doing workshops. One of our core values is to create a non-discriminatory environment. Ecotopia Biketour is for anyone interested in travelling by bike, community life, DIY, an ecological lifestyle, and/or learning by experience. If this sounds good to you, feel welcome to join us! Read more about what the Ecotopia Biketour is. We will have the Spring meeting on 18-22 April in Berlin! Read more about it here. If you are planning to join you can follow the informations on this web page. Also if you would like to help or just to get an insight into the organisation write us via the contact form. Because we all have different visions of life and diverse personalities, Ecotopia Biketour has developed a set of basic values which helps all of us to create similar expectations from this project. As we oppose any leadership or hierachical structures, the Biketour is organised in an open way where everyone can be a part of. We try to use free and open-source software as much as possible in the preparation process. The same goes for sharing photos and videos in the group. Everyone should be able to cycle with the Biketour. Therefore we keep distances low and have scouts going ahead who mark the route. Everyone can follow the signs on their own level of speed. Any tasks like scouting, cooking or pulling a trailer are shared. All communal food on Biketour is vegan and cooked with wood on our mobile rocket stove. Whenever it's possible we go dumpster-diving and buy food from local farmers and small shops. We plan and make many activities on the tour: skill-sharing, helping at projects, joining actions and protests, bike-fixing and other events.